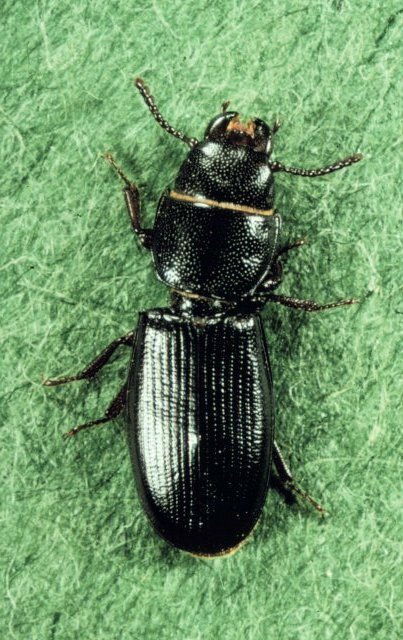 The adult Cadelle Beetle is a shiny black insect with an elongated flattened body. It has a distinct "waist" between the thorax and the wing covers. Males have lots of very fine punctures on the underside of the abdomen, whereas females have fewer coarser punctures. 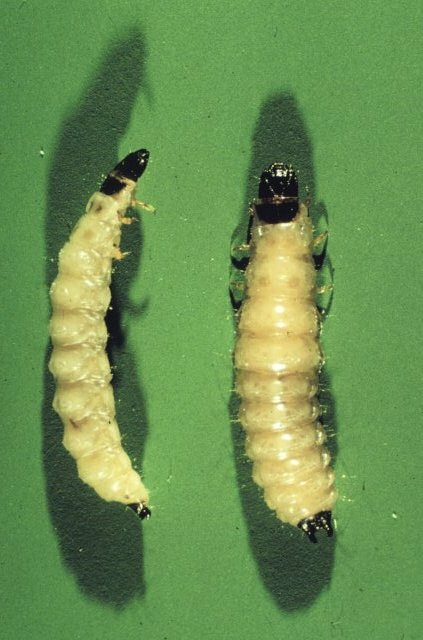 The larva is white to pale grey with a black head, two pairs of black patches on the back and two black horns at the tip of the abdomen. found in grain stores and mills. Larvae also bore into timber and through sacks, causing damage to the storage as well as the product. They prefer dimly lit areas with cracks and crevices to hide in. The Cadelle beetle is a pest species that has spread to all parts of the world including Australia.